Reading glasses aren’t just for people over 40 anymore, reports a CBS affiliate in Chicago. All our texting, ebook-reading, ipad use and other small screen viewing is messing with our vision. Dr. Valerie Kattouf, chief of pediatric optometry at the Illinois Eye Institute, says more of her young patients need reading glasses.“I see it in school-age kids. I see it in older school-age kids – the teenagers – and I see it a lot in young adults of working age, you know, 20s and 30s,” Kattouf said.Kattouf says it is not just the fault of small cell phone screens and tablet computers. That on top of homework and reading – whether print or online – can lead to focus problems. “The intensity of the near work without any kind of breaks or attention to what that does to you,” she said.She says young people have always had vision problems, but she thinks the increase in the amount of time they spend doing what she calls “close work” is leading to more problems with far-sightedness.Kattouf suggests limiting screen time and taking frequent breaks to look off in the distance in order to rest your eyes. That's good advice. An easy way to remember is to think of the 20/20 rule: if you want to maintain your 20/20 vision, make sure that every twenty minutes, you take a break and look into the distance for at least 20 seconds. The impact of the digital revolution on our vision is becomming more prevalent as more people join the digital device generation and, not surprisingly, it is getting more attention in the media. The New York Times had an article on Computer Vision Syndrome recently. 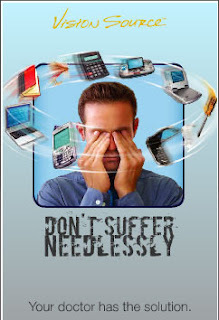 To learn more about Computer Vision Syndrom and visual fatigue and what you can do about it, click here. Technology-related vision problems are fast becomming a major segment of the vision disorders that the Vision Source Vancouver optometrists deal with every day. We have solutions to prevent the problem, to fight visual fatigue and discomfort and to make vision the best that it can be when interacting with digital screens. And a note on reading glasses. If you read my previous post, you will note that if you need reading glasses, it's better to stay away from the ready-made readers that you get from a drug store or book store because, more likely than not, they don't measure up to optical standards.